The Monta Loma tract is just east of the former Hewlett-Packard Mayfield facility. 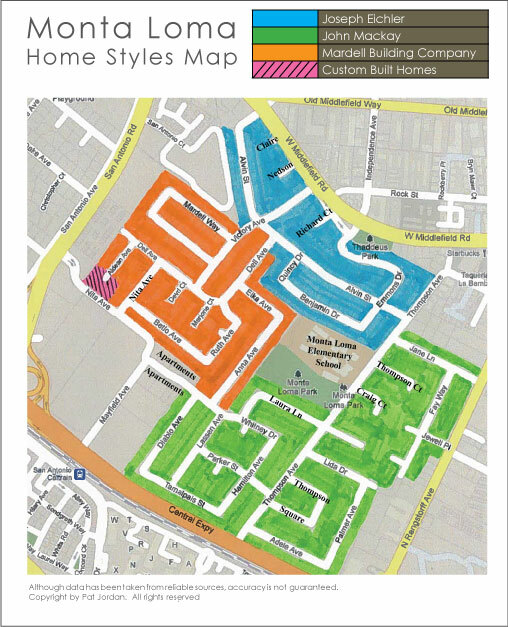 It is bordered by San Antonio Road to the west, Middlefield Road on the north, Rengstorff Avenue on the east, and Central Expressway on the south. Architecturally, it is a sort of 7/8ths-scale replica of South Palo Alto, all contemporaries, except that the homes are even smaller here. 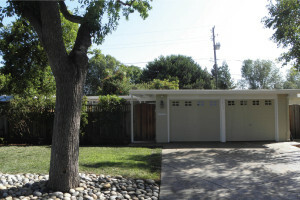 Eichler was active in Monta Loma in 1954, building over 200 homes in a tract called “Fairview.” They are three bedroom, two bath homes, almost all 1,116 sq. ft. Eichler’s competitor, John Mackay, went into Monta Loma in a big way in 1955–56, also leaving behind over 200 3/2 flattops. Almost half are on slab, most of them 1,104 sq. ft., but a handful of 1,344 sq. ft. Built in 1955 to 1959, Mardell Manor was the last Monta Loma tract to be built, its homes indistinguishable from Eichlers and Mackays to the casual observer. Here’s how to tell the players: Eichlers have plank ceilings; Mardells also do but, unlike Eichlers, originally came with hardwood floors; Mackays sometimes had hardwood but always have painted Celotex ceilings. *Unique features. Presumed current, no warranties.